Houston LaGuinn Miers, Sr, 88 of Dawsonville, GA passed away peacefully on Friday, July 6, 2018 at Gold City Convalescent Center, Dahlonega, GA with his family by his side. 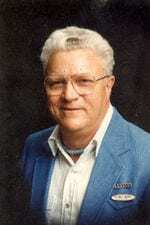 He was one of the premier Square Dance Caller’s and teachers in the Southeast for 45 years. He was a 32 Degree Mason, Shriner and Jester. Houston was an avid stain glass designer, and spent most of his life as a Master Printer. He is survived by his wife of 53 years, Beverly Bryant Miers of Dawsonville, GA; children, Teresa Pruitt Nichols of Lawrenceville, GA, Houston L. Miers, Jr, of Gainesville, GA, Emily Sharon Summers of Jasper, GA; grandchildren, Dennis, Matthew, Ethan, and Carly; and six great grandchildren. A Graveside Service will be held on Monday, July 9, 2018 at 12:00 p.m. at Westview Cemetery, Atlanta, GA. The family will receive friends on Sunday, July 8, 2018 from 2:00 – 5:00 p.m. at Bearden Funeral Home, Dawsonville, GA.
Houston LaGuinn Miers obituary Sr.